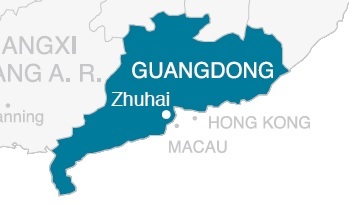 Zhuhai is located in the southern part of Guangdong Province, bordering specially administered region Macau. Zhuhai is one of the four Special Economic Zones (SEZs) established in 1980 based on the Reform and Opening Up Policy 1978. After more than three decades of economic transformation, it has become a major manufacturing base for electronic products, such as mobile phones, computers, audiovisual products etc. It is designated to be a high-tech research area where heavy industries are not allowed to be set up in the city. Zhuhai is located in an area with many airports. All of the international cargo airports within the Pearl River Delta (Guangzhou, Shenzhen, Macao and Hong Kong) are less than 2 hours' drive from Zhuhai. The Port of Zhuhai, which is composed of seven major areas (Gaolan, Wanshan, Jiuzhou, Xiangzhou, Tangjia, Hongwan and Doumen), is one of the major hubs along the Chinese coastline. Jiuzhou Port offers daily trips to Hong Kong, Shenzhen, and many other ports in China. Doumen Port offers trips between Hon Kong and Zhuhai. Wanzhai Port offers trips between Macau and Zhuhai. The city is connected to Guangzhou by a new high-speed passenger railway (2011) and a new freight railway (2012). The construction of the Hong Kong-Zhuhai-Macao Bridge began in December 2009. Upon completion, it will shorten the journey between Zhuhai and Hong Kong to about 30 minutes. Zhuhai is a major port city in China. Its geographical advantages have turned it into an appealing place for investments. The construction of the Hong Kong-Zhuhai-Macau Bridge (estimated to be completed in 2017) should further contribute to Zhuhai's economic growth. In 2015, Zhuhai's total foreign trade value amounted to USD 71.3 billion. Since Zhuhai was planned as a high-tech research area, heavy industries have not been allowed to set up in the municipality. Zhuhai is one of the most prosperous zones in China. It is currently home to three development zones and one free trade zone. The Zhuhai Hi-tech Zone was approved by the State Council in December 1992. Covering an area of 139 square kilometers, it was established in March 1993. Due to its endowments of high-skilled talent, the main park of the Zhuhai Hi-tech Zone has become an important hub of production, study, and research. This development zone is strategically located between the two Chinese special administrative regions (Macao in the west and Hong Kong in the east). This has turned Zhuhai Wanshan Maritime Development Experiment Zone into one of the most important zones in the area. Situated at the mouth of the Pearl River, the development zone houses six international waterways and covers a marine area of 3,200 square kilometers. With a total size of 380 square kilometers, the Gaolan Port Economic Zone has become southern China's large-scale harbor industrial zone. The zone mainly focuses on equipment manufacturing, petrochemicals, and energy. From 2008-2009, the economic strength of Gaolan Port Economic Zone ranked first among the provincial Economic Development Zones of Guangdong Province. In 1996 the State Council approved the foundation of the Zhuhai FTZ. The Administrative Committee of the FTZ was established in June 1997. In its first year of existence, the FTZ received a total investment of USD 1 billion from more than 200 companies from over 20 different countries and regions. The Zhuhai FTZ covers an area of 3 square kilometers. Hengqin is part of the city Zhuhai, which is contiguous directly to the Special Economic Zone of Macao, and was opened 2015 within the Free Trade Zone of Guangdong. This zone is a pilot concept for market liberalization and reduction of bureaucracy in investment projects. As in the Free Trade Zone of Shanghai, there are simplified measures to register a company and the implementation of negative lists. A special focus is put on biotechnology, finance, tourism and creative industries. Companies of those sectors registered in Hengqin are enjoying special comprehensive tax incentives. With an area of more than 4 million square meters, Baijiao Science and Technology Industrial Park is located on the edge of the Baiteng Lake in the center of the grand Western District of Zhuhai City. It's a key hub for light industry, machinery manufacturing, new materials, environmental protection technologies and high-yield, high-quality and high-return agriculture. Located in the southwest Pearl River Delta, the Zhuhai Fushan Industrial Park is at the confluence of Zhuhai, Zhongshan, and Jiangmen. Plans for Fushan Industrial Park is to become a national model for new industrialization, a global port-related advanced manufacturing base, and an ecological intelligence city. Over the past six years, the park has persistently introduced quality projects of high-end service, high-end manufacturing, and hi-tech industry. Guangdong Zhuhai Model Base for Industrialization of Hi-tech Achievements is located on the edge of Tangjia Bay on the side of Gangwan Avenue. The park focuses on electronics and IT, biotechnology, photo mechatronics and new materials. Nanping Science and Technology Industrial Park, covering 4.2 million square meters in the Nanping Town in the suburb of Zhuhai City, concentrates on the development of high-tech industries including electronics and IT, biopharmaceuticals, new energy and new materials. Sanzao Science and Technology Industrial Park occupies an area of 2.66 million square meters along the West Airport Road, the western District, Zhuhai. It is mainly a hub for high-tech industries, focusing on industries as electronics and IT, biopharmaceuticals and environmental protection. Technological Innovation Beach, also known as Zhuhai Model Base for Industrialization of Hi-tech Achievements is an important constituent of Zhuhai National Level Hi-tech Industrial Development Zone. Cosponsored by Zhuhai municipal government and the Torch Program Center of the State Ministry of Science and Technology, it is a "corridor" of hi-tech industries spearheaded by such high technologies as electronics and IT, computer software, network communications and photo mechatronics. Xinqing Science and Technology Industrial Park covers an area of 3.44 million square meters of the Industrial Corridor of Zhufeng Avenue in Doumen, Zhuhai City. This park is specialized in the development of electronics and communications, especially printed circuit boards. This industrial park focuses on general aviation manufacturing, aircraft operations and services, maintenance, parts and components, material sales and distribution, MICE, recreation, R&D, education, supporting manufacture, bonded warehousing, and logistics. The Zhuhai Harbor Industrial Zone, located in the west of Zhuhai, was listed as one of the four key development areas of Guangdong Province in 1992.Occupying 100 sq. km, it has one of the country's key coastal ports, which is cited as a State Class A port. The extensive harbor, and ample resources of land and water provide a sound environment for the operation of chemical and energy industries and dock warehousing. Zhuhai-Macau Cross-border Industrial Park is established to facilitate trade and investment between Zhuhai and Macau.